Aww look at that! 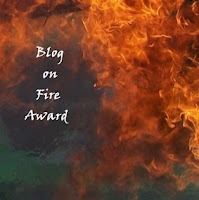 I've been awarded a Blog on Fire Award. Love the colors - they go so well with my color-scheme! Congrats - you deserve it! The colors do work well with your color scheme. It's always nice when that happens. Nice award! Lately I've not felt very on fire about anything LOL, especially not my blog....maybe after the A to Z Challenge is over. Congratulations, Sue. I see we both enjoy similar music (drums and guitar). You might like Medwyn Goodall's Clan: A Celtic Journey - lots of passionate drumming.